Denver Duct Work Rennovation | All Temperatures Controlled, Inc. Denver Duct Work Rennovation | All Temperatures Controlled, Inc. The ducts also control how much air is delivered to each room. The right amount of air will keep the room temperatures where they need to be. If ducts are damaged, improperly installed or the wrong size, they can cut your system’s ability to heat or cool by more than half on hot or cold days, when you need it the most. Your system may or may not be delivering air evenly. 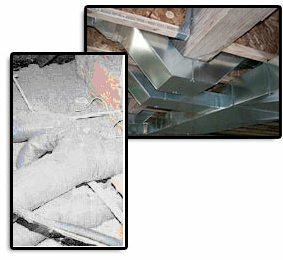 Ducts move air, and air is invisible — so to determine if your ducts work or not, air properties must be measured. As a HVAC contractor for Denver and surrounding areas, All Temperatures Controlled, Inc. can measure how much air goes to each room and compare it to how much is needed. We will also take other measurements including temperatures and pressures to determine how well your ducts work.